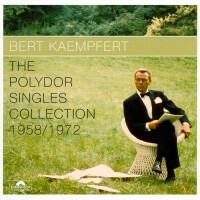 As early as the 1950s Bert Kaempfert was Polydor’s arranger and producer. It was at this time that Bert Kaempfert also began to compose: at first he used the pseudonym Marc Bones, but he later changed to using his own name. All the singles which appeared on the Polydor label in Germany have been compiled and are now being re-released on this double CD for the very first time. Among them are treasures which have never appeared on compact disc before, such as the choral versions of Only A Fool (Would Lose You) and Lonely Is The Name. For lovers and collectors of this orchestral music, a dream has here come true: early recordings, often made in Hamburg’s Musikhalle if the ensemble was a small one, will conjure up many pleasant memories. Hits of their day such as Mitternachts-Blues, Ducky, Patricia, Catalania, Explorer and Cerveza are all now heard here in their original single version, some of which were released later in a different version on LP. Cha! Bull! and Shepherd’s Cha-Cha are two titles from the LP compilation “Ssh! It’s … Bert Kaempfert” which was released later in England and which are now being re-released here.